Continuing to build its UK brand-presence, Mora Kniv will display its latest collection of outdoor knives at OTS 2016. 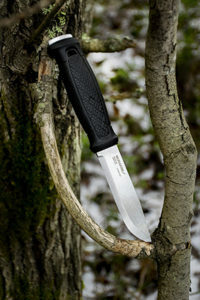 Ideal for camping, bushcraft and everyday outdoor activities, all Mora knives are manufactured at the company’s headquarters in Sweden for guaranteed quality and performance. At OTS, Mora will exhibit the new Garberg, the brand’s first ‘full tang’ knife. The Garberg features an expertly-hardened, 3.2mm blade with a Scandi-grind that makes it easier to keep sharp. The spine of the knife’s blade can be used with a fire starter and the Garberg comes with a luxurious and durable leather sheath. Find out more about Mora at OTS 2016, stand 63.